What’s your bridal lehenga gonna be like? Which shades are you planning to pick that’ll make your bridal lehenga colour combination the most unique? With brides getting more and more adventurous with their choice of bridal lehenga colour combinations, it’s very easy to be lost in this sea of options available out there! With mono-tone lehengas taking a back seat, it’s about time to pick a lehenga colour combination to hold everyone’s gaze at any moment. Lehenga colours like ivory, pastel pink, fuschia pink and gold have caused a sensation this wedding season. Kareena Kapoor stole all hearts in stunning off shoulder yellow and beige with muted tones of red lehenga colour combination. This Abu Jani Sandeep Khosla lehenga is definitely what bridal dreams are made of! Not one for convention, Sonam Kapoor forsake sequins, beadwork and pastels and in turn favoured a grey and white graphic lehenga by Anamika Khanna for her reception and looked phenomenal. This Sabyasachi bride choose to wear a green and red bridal lehenga colour combination and it’s been really hard for us to take our eyes off it. She was the first bride of the season who went for this bandhani lehenga comprising of double dupattas with one shimmery and the other bandhani. Sonam Kapoor made a lot of noise with her ivory and gold lehenga which she wore for her mehendi. This Abu Jani and Sandeep Khosla lehenga took over 18 months to come to life and each panel of the lehenga skirt features a unique set of motifs done in intricate chikankari. Urmi Daga Shah - the face behind What Wear How choose to wear a beautiful lehenga that had floral motifs, deliciously mixed with a pastel hue of pink and beige that gave a beautiful and romantic look to the outfit, perfectly complimenting the feel of the wedding. How stunning is this bridal lehenga colour combination? Sonam wore a gold and dusty pink lehenga colour combination stealing a million hearts in Veere Di Wedding. I am in love with this fish tail lehenga skirt paired with a sequin encrusted bustier and checkered embroidery cape sleeves. Saudamini Mattu - the CEO of Abu Jani and Sandeep Khosla choose to wear a magenta lehenga embroidered with lime green, peacock blue and tangerine threads for her wedding and that lehenga colour combination was loved by all. She draped an inky blue bandhani dupatta over her lehenga, adding more colour to her look and looked just stunning! I totally admire how this bride has ditched all the red and pink bridal lehengas and opted for an ivory based and gold lehenga colour combination with multi-coloured embroidery on it. This bride definitely turned heads all the way! Planning to ditch all those red bridal lehengas and try a lehenga colour combination which is even trending internationally? You have got to try this unicorn inspired Manish Malhotra lehenga. This bride chose to wear a pastel pink with white bridal lehenga colour combination and the details are to fall in love with. If you are a bride who wants to opt for a pink bridal lehenga for her wedding, then this fuschia pink and pastel pink lehenga colour combination is perfect for you. I am totally crushing over these floral motifs and zari embroidery lehenga skirt paired with a heavily embellished choli. She completed the look with sheer double dupattas with one being in the same colour family and another being a light pastel shade totally setting some fresh goals. I am in love with how how simple yet royal this bride's lehenga colour combination is! This ivory based lehenga with blue and pink lotuses paired with a fuschia pink lehenga is definitely a head turner. This blood red and muted tones of blue lehenga colour combination is great for all brides who like it a little traditional. This Manish Malhotra ensemble is totally a refreshing take on all the red and pink lehengas we have been seeing lately! For her mehendi, Sagarika wore a turquoise meets sea green lehenga colour combination looking her radiant self. This Anita Dongre enselmber was quite a stunner. Okay we are still not over Sonam’s pastel-hued outfit by Anuradha Vakil. Because only a fashionista bride like Mrs. Kapoor-Ahuja can wear the shades of lilac, peach and white lehenga colour combination heavy gotta patti work and look phenomenal. A yellow and pink lehenga combination will never fail you, as it can be clearly seen how beautiful this bride is looking in a banarasi lehenga on her mehendi. This is a Weddingz.in exclusive pick lehenga colour combination for a sangeet ceremony. We were completely taken aback with this peach and gold color lehenga-choli crafted from the net fabric and the combination of hand and machine embroidery all over, with its sheer dupatta bringing the much needed dramatic effect. Bhumi Pednekar looked like a million bucks in this sky blue and golden lehenga colour combination by Abu-Jani and turned heads all the way! This knock out pink lehenga-choli with a touch of bluish-grey lehenga colour combination is pure love. Seriously digging those grey and yellow latkans on the pink bridal lehenga skirt though! Sonam Kapoor opted to walk the red carpet of Cannes in an off-white, embellished lehenga, courtesy Ralph and Russo and looked every bit phenomenal. Yes, Mrs. Sonam Kapoor Ahuja opted for a lehenga for Cannes red carpet - setting major #BridalWearGoals. This one is another stunning Sabyasachi bride wearing a gulkand burgundy and ivory lehenga colour combination! The high waisted velvet flared lehenga skirt with zari and resham embroidery compliments the heavily embroidered blouse in the most royal way ever. This gold and blush pink lehenga colour combination is definitely bridal goals. What I love the most about this pink bridal lehenga is the golden detailing and the peplum blouse, making it look so unique! Is it just me or you too are finding it really hard to take your eyes off this bride’s egg shell blue and gold lehenga colour combination? I say #StunnerAlert! Last but not the least, I don’t think I’m ever getting over Anushka Sharma’s blush pink and Ivory lehenga colour combination which she wore for her private wedding in Tuscany. This Sabyasachi renaissance embroidery in vintage English colours embellished with silver-gold metal thread, pearls and beads will forever remain a classic. 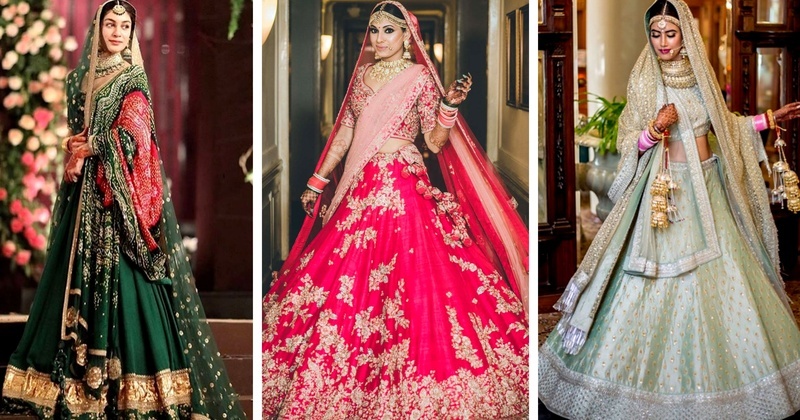 So, with this our list of top lehenga colour combinations for the Indian bride comes to an end, hoping that you would have somewhere decided on your lehenga colour!